We should mention the recent arrival of brushless motors onto the cordless tool market. Brushless motors operate in a significantly more efficient way than their conventional ‘brushed’ counterparts. They use modified components and a small electronic sensor/controller in their motor to eliminate friction (always a by-product of a brushed motor) and thus deliver more power. The amount of power that is delivered is also controlled by the amount of resistance the drill encounters. The brushless motor only generates as much power as it needs. Traditional brushed motors on the other hand will always deliver the maximum power they can, when fed the same amount of current. 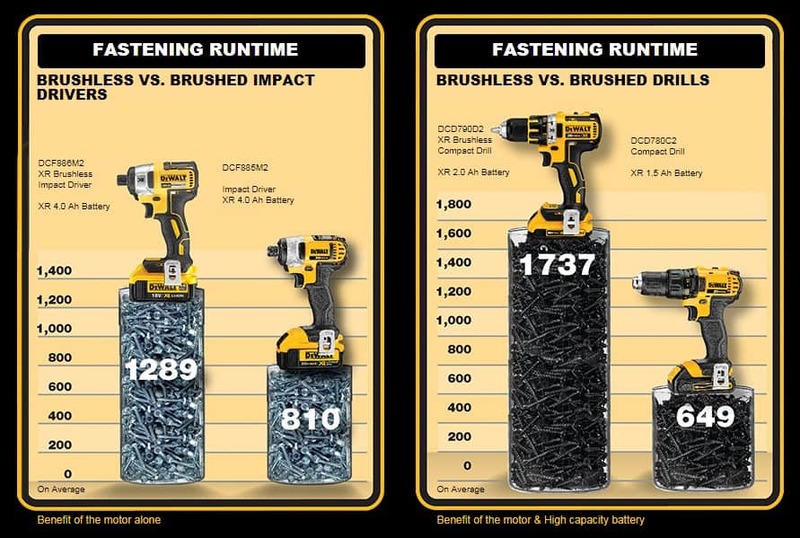 Note however a brushless tool can never deliver ‘more’ power than its brushed counterpart. But by eliminating the friction a brushless motor runs cooler, more efficiently and quietly and with less vibration than a brushed motor. Using an example from the Dewalt website below you can see this extra efficiency translated into usage when fastening screws. The brushless motor also sees greater longevity because its mechanical components are less likely to fail. These benefits do come at a cost though – approximately 30% more than the equivalent tool running with a brushed motor. Tools with brushless motors are designed to work with Li-Ion batteries so that cost needs to be taken into consideration too. Taking all this into account you need to be quite a serious power tool user to justify a brushless version, and quite possibly a professional, unless of course cost is less of an issue and you want the luxury of having the best tool for the job!